Upon arrival at Incheon International Airport, you will be met by our representative and transferred to your hotel by a local driver. After hotel check in, spend rest of the day free at leisure. After breakfast, you will be met by a local driver and transferred to Seoul Station, then you will board on KTX bullet-train head to Singyeongju station [KTX121 09:00 - 11:00] on your own. Upon arrival at Shingyeongju station, you will met by a tour guide. Enjoy half day Gyeongju tour. Your first stop is Bulguksa Temple, the representative relic of Gyeongju and continue visit to Gyeongju Folk Craft Village, a home to craftsman and artisans. Finally, you will enjoy little walking at Anapji Pond, designed as a park for royalty. After tour, transfer to hotel and rest of day is at leisure. Lunch will be served en route at a local restaurant. After breakfast and check out, meet our tour guide at your hotel lobby. Visit Daereungwon Tomb Complex, large ancient tombs of kings and nobles of the Silla Kingdom and Cheomseongdae, the oldest existing astronomical observatory in Asia, in the morning. Leave for Busan, the largest port city in Korea via Hanatour vehicle. After hotel check-in, you will enjoy free time at Haeundae Beach. Sightseeing of the city of Busan will be Busan Tower, the symbol of Busan and Jagalchi Market, located on the shore side road in Busan, the largest seafood market selling both live and dried fish. After tour, transfer to hotel and rest of day is at leisure. Lunch will be served en route at a local restaurant. After breakfast and hotel check out, meet our tour guide at hotel lobby. Visit Haedong Yonggungsa Seaside Temple and Dongbaekseom island. After tour and lunch time, You will be dropped off at Busan Station after tour. Return to Seoul via KTX bullet-train [KTX152 15:10 17:47] on your own. 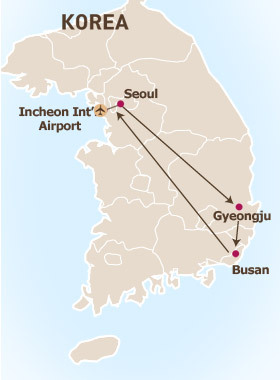 Upon arrival at Seoul Station, you will be met by a local driver and transferred to hotel. After hotel check in, rest of day is free at leisure. Lunch will be served en route at a local restaurant. US$ 1725 per person- based on 2 sharing a room and airport transfers.